When the Greeks gathered in Olympia for the first Olympic Games in 776 BBC, I’m sure they never imagined that one day, far in the future, the Games would be held high in snow covered mountains or on playing fields made of ice. How could they know that their foot races would turn into races on blades (speed skating) and chariot races would become daring flights around a track made of pure ice (bobsled)? In 1924, the first Winter Olympics was held in Chamonix, France featuring cold-weather sports. Today we celebrate these Winter Games every four years. 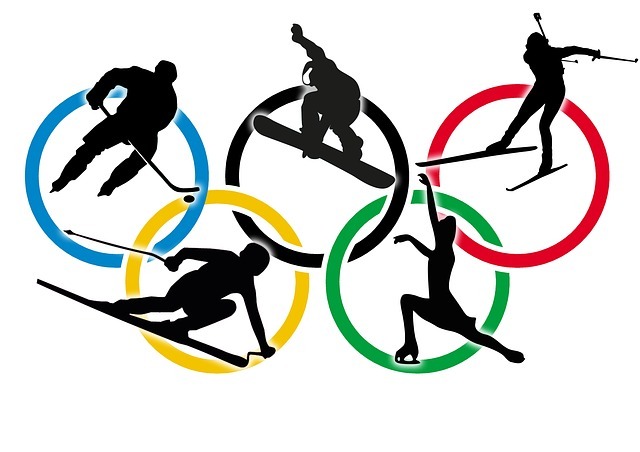 Did you know that just like the Olympic Games themselves, many of the winter sports have ancient and historical origins? 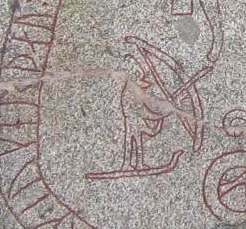 The Böksta Runestone is believed to depict the Viking god Ullr with his skis and his bow. Circa 1050 CE. Skiing, one of the most exhilarating sports of the Winter Games, began over 8,000 years ago. We’ve found lots of archaeological evidence that proves we’ve been sliding around in the snow for thousands of years. An ancient wooden ski from 6300-5000 BCE was uncovered at Lake Sindor near Moscow in Russia. 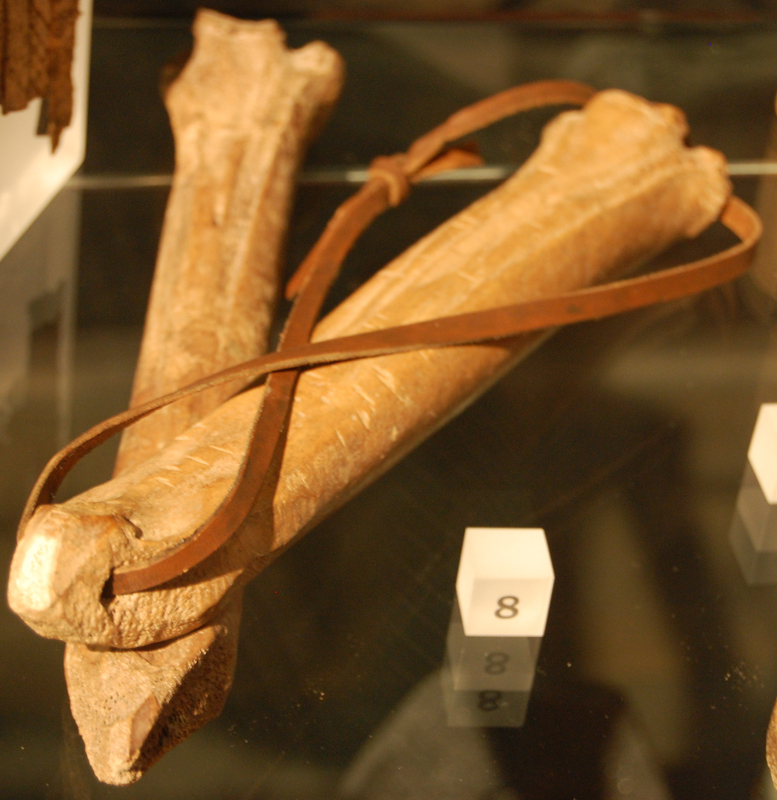 A ski found in Norway dates to 5100 BCE and one in Sweden dates to 3300 BCE. While these ancient people were probably using skis for transportation, the Chinese were actually playing games. Around 1,400 years ago the people of Daxing’anling in China invented a game called “riding on wood” in which they tied a wooden board (4 feet long, 5 inches wide) to their feet and raced across the snow. Today, we’ve taken ancient board-riding to a whole new level with ski jumping, slalom, moguls and even the modern variation of snowboarding. Which one is your favorite? Have you ever been to an ice hockey game? Do you have a favorite team? Hockey is a very popular sport in the Winter Olympics and like the other sports we’ve described also has an ancient past. As far back as 2800 BCE ancient Egyptians played a form of hockey—without the ice of course. Drawings at the tombs of Beni Hassan show players holding bats made of long palm tree branches. The branches are bent just like modern hockey bats. The ball or puck was made of compressed papyrus fibers covered with two pieces of leather in the shape of a semicircle and dyed two or more colors. The Greeks and Romans adopted the game from the Egyptians and it was carried into the Middle Ages. Around 1,000 years ago the Ethiopians began a game called ganna that is similar to hockey. It is played during the Ethiopian Christmas festival, also called ganna, and uses a long curved wooden stick and a round wooden ball. Close-up view of a section of the Tepantitla murals. Even the Mesoamericans enjoyed a form of hockey. 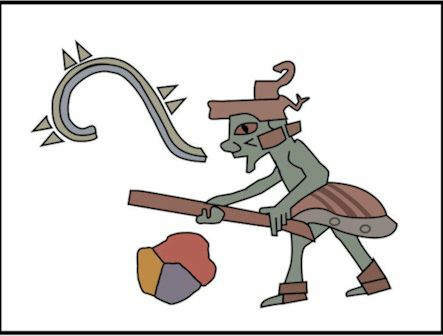 The Tepantitla murals at Teotihuacan (c. 150 BCE-600 CE) show men using sticks curved like modern hockey sticks and hitting an object. Just like modern hockey, this game was apparently very dangerous. The Icelandic sagas or stories speak of Vikings playing knattleikr more than a thousand years ago on frozen surfaces or grass. The game had many of the same elements as our modern games of hockey and football. Colf was a popular game during the Dutch Middle Ages played with a ball and long sticks on ice and was a cross between golf and hockey. Finally, let’s hear it for the Canadians. In the 1870s they developed the rules for the modern sport of ice hockey, which became wildly popular and was adopted as a national sport. 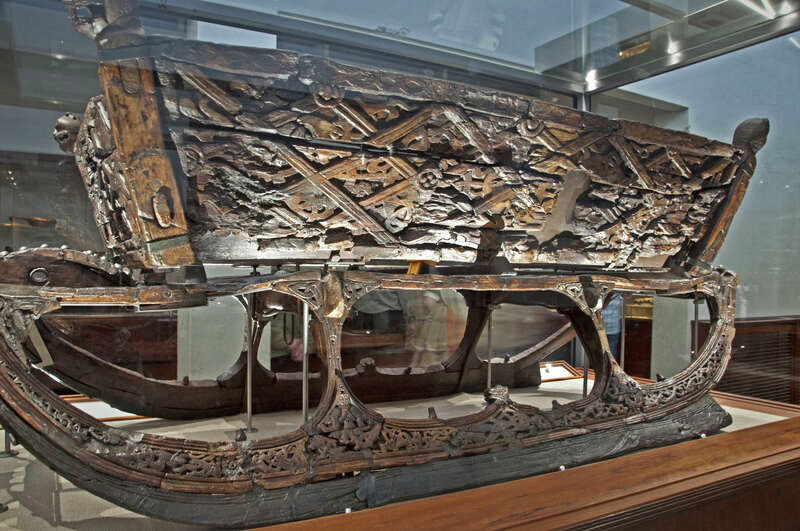 Ancient Viking sled found on the Osberg Viking ship. What is luge? It’s a sport in which people ride small sleds down extremely fast ice tracks and use their reflexes to steer. The first modern luge race took place in 1883 in Switzerland, but the origins of the luge go back to ancient times. The word “luge” can probably be traced back to 9th century Gaul (an ancient region that included France) and means “sled.” Sleds date back to antiquity: The Egyptians used sleds in construction, sleds have been found on excavated Viking ships and the Chinese during the Tang Dynasty even wrote about the Mongol-Turkish tribes who “skimmed over the ice on wooden horses.” The use of sleds for transportation slowly developed into sled racing. Chronicles from Norway in 1480 are the earliest evidence of these races. Eventually the races became more organized, the tracks faster and more defined and the sleds smaller. Today, luge is a dangerous and exciting attraction in the Winter Olympics. 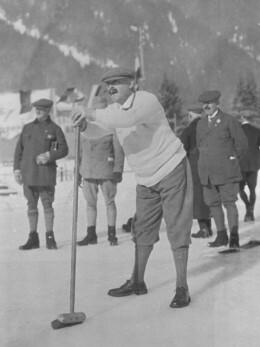 WK Jackson skipping at the first Olympic Winter Games in Chamonix in 1924. We don’t actually know how far back the team sport of curling goes, but it has a long history. Do you know about the sport of curling? Two teams push a granite stone across rinks of ice and try to score points by getting the stone to land within a target area. It is nicknamed “The Roaring Game” because of the sound the 44-pound stone makes as it “roars” across the ice. The first evidence of curling comes from Scotland in the 16th century. They used to play on frozen ponds during harsh winters. Do you think that maybe the ancient people of Great Britain handed this game down from generation to generation? It’s possible that the sport of curling, just like skiing, sledding and skating, has ancient origins, but that we simply haven’t discovered its history yet. We do know that the sport is still played outside where the weather permits, but national and international competitions are played inside on temperature controlled rinks. Do you want to carry on the ancient tradition of winter sports? There are many fun games to play and exciting competitions to watch this Olympic season. Whether you want to be an athlete or a spectator, we’re all helping to keep the past alive as we cheer on the competitors of the XXII Winter Olympic Games! Click here to download a pdf of Winter Olympics sports coloring pages. Color each of the athletes in the colors of your favorite country in that sport. Label each sport. Choose your favorite sport and do a one page research paper about its history. This entry was posted in Blog, Holidays, Kids Blog, Kids: Holidays, Kids: Public Life, Kids: Recreation, Kids: Sports, Public Life, Recreation, Sports and tagged ancient history, AntiquityNOW, curling, Egypt, Ethiopia, ganna, Greece, ice hockey, ice skating, luge, Mesoamerica, Norway, Olympia, Olympics, Russia, skiing, Sweden, winter sports. Bookmark the permalink.